Hope you all are aware about Earth Hour 60 and switched off your lights on 27-Mar-2010 from 08:30PM to 09:30PM. Which one do Rajni fans prefer? Idly or Dosa? Why? 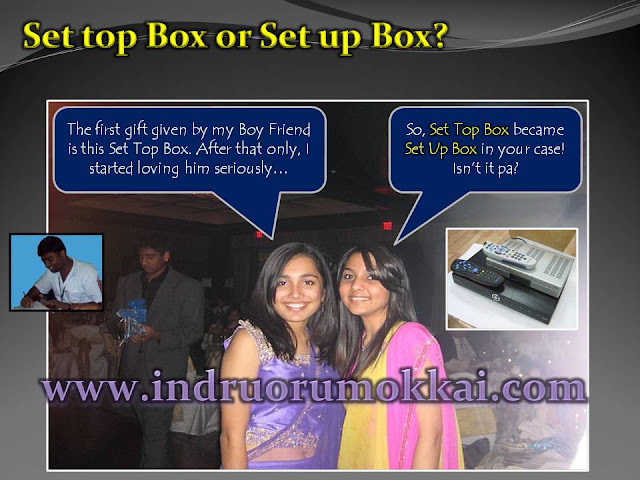 What will happen if Indru Oru Mokkai Blog didn't talk about Actor Murali? aiyo... aiyo... sema comedy... sorry... sema mokkai! Hope you all are aware about the Aircel's initiative towards saving the tigers. Currently there are only 1411 tigers in India. Visit the website www.saveourtigers.com to help the tigers to live in India, to support this and to Join the roar! Please save our tigers by participating in the 1411 tigers campaign. Find the painting below. I was amazed to see such an excellent art. Painting of a tiger in a girl's body. Hope this post is a good treat for people who loves mokkai as well as art! Hope you all are enjoying our blog! Our Indru Oru Mokkai Blog is one of the blogs for mokkai, mokkai and only mokkai. The entire world is aware about this! But. what about the owner of this blog? How will be the person who is updating the best mokkai jokes daily? OK. I don't want to maintain suspense still. I am enclosing my interview during my college days below. 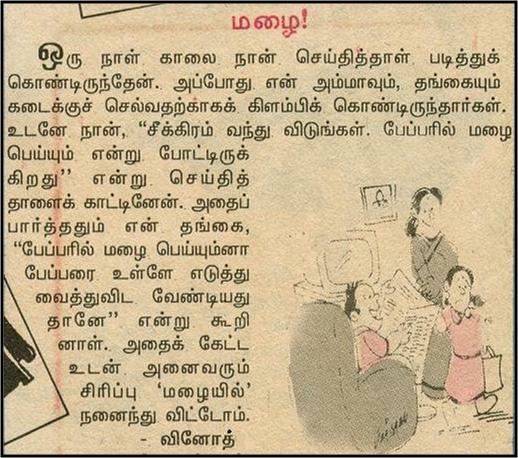 People from Kalki magazine interviewed me and the same is published in the 13-Jan-2002 edition of Kalki on the day of Pongal. Our Indru Oru Mokkai blog achieved one more mile stone. If you search using the keyword '2010 best mokkai jokes' in Google, our Indru oru Mokkai Blog occupies the first three places in the search results. Thanks a lot to all the viewers for your support! Ungal Nallasiyudan, Bramaandamai - Indru Oru Mokkai Blog! Is it possible for you to prove that 2/10 = 2? If you're a normal person you can't prove. But, if you're an Indru Oru Mokkai blog viewer, you should be in a position to prove. How? Indru Oru Mokkai - A Mokkai a day, keeps Doctor away! It gives immense pleasure for me to share this with you. We've started this indruorumokkai blog last week. Our Indru Oru Mokkai blog's hit rate and network traffic are increasing day by day. Thanks to all the viewers who're visiting this indru oru mokkai blog daily and for supporting me! Special thanks to the people who shared their views in this blog by posting their comments. Yes... If we search our blog in Google using the keywords 'indruorumokkai' or 'indru oru mokkai', the first search result will be our blog! Please find below the screen shots of the search results! Thanks a lot for your support! Don't forget to share your views by posting comments. See you tomorrow with a good mokkai. Bye!